I decided to make a draped garment for Christmas Day… I know. Not surprised? Drape Drape 2, Number 4. Back/side view. I had planned a ‘drunk candy’ draped tank dress (plenty of room of Christmas lunch). I loved the idea of messing with the ubiquitous candy canes at this time of year. However the only red striped knit I could find was a much finer stripe than I wanted to get the right look. So I decided to make a t-shirt instead – and settled on Drape Drape 2, Number 4 – previously blogged here. Note: I didn’t get drunk on Christmas Day. In fact I very rarely get drunk, tipsy is about as exciting as I get. This is such a simple t-shirt to make, one piece for the body & one piece for the neck. It took less than an hour to sew up – with sleeves & the hem finished on my coverstitch machine (a beast I am slowly taming & learning to love). Construction tips: The neckline on this is huge – this is a Japanese S/M size and I tend to pull it backwards so it’s not indecently low. I’d also say if you are stripe-matching junkie – this is not for you. You just have to surrender to the crazy for this one. Drape Drape 2, Number 4. 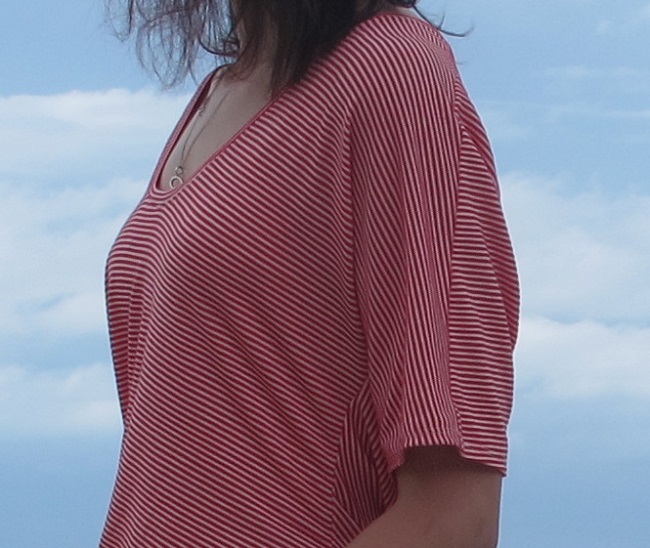 Draped sleeve stripes – ‘not’ matching. Drape Drape 2, Number 4. ‘Straight’ sleeve stripes – ‘not’ matching. We took the above photos post-Christmas in the first break in the rain (it’s been stinking hot and sunny ever since of course). On Christmas Day I looked so exhausted and I was – I slept for four hours during Christmas Day. I’m so glad that the offices are closed and I have 11 days to rest. I’m not a New Year type. I think I will wake up tomorrow and be the same person, in the same life. I guess that sounds cynical – but it’s also reality. That all sounds glummer than it should. It’s not meant to. I’m generally a positive person. I like to laugh. I like happiness. It’s a good way to live. May your days be filled happiness – and on the not-so-good days – with kindness and courage. Pattern: Drape Drape 2, Number 4. This entry was posted in Drape Drape, Sewing Projects, Tops and tagged Drape Drape by sewbusylizzy. Bookmark the permalink. I love the shirt – it’s you! I hope that 2015 finds us with the courage to let go of some things that we don’t need and the grace to appreciate what we’ve had. I know I am trying to learn to do both of those things. You have made some beautiful garments this year, Lizzy! Thanks for sharing them with me. Cheers! Grace. That’s such a little yet dignified word. Something I wish I had more of. Well said. Love the top! I agree with you about New Year’s Day. It’s a very arbitrary date to start the new year (not even perihelion, which is Jan. 4). I don’t believe in New Year’s resolutions, because why wait? BUT since it a) gives me a holiday and b) means that I’ll have to write a new date on the blackboard on Monday, it’s as good a time as any to wish you all the happiness you deserve for the next 365 days and beyond. I’ve always liked those lines from Adam Lindsay Gordon. Love your candy cane top (and all your drape creations). Best wishes for the new year, laugher and happiness for you and your family. Thank you – it just popped into my head and it seemed a nice way to think about oneself and others. May you have a lovely and peaceful 2015. Blessings on the New Year. Thank you all for speaking of Grace courage and kindness. We can all give and receive these. What lovely words. I am always in awe of how much you pack into your life. Work, bringing up children and prolific sewing. I will not look back on 2014 with any pleasure as it has been a stressful year for me but looking forward to 2015 and wishing you a peaceful and happy year. I confess, 2014 was very tough, so many commitments for myself and my children – I was completely exhausted by Christmas. I hope that my 2015 and yours is much better! It’s so easy to judge – but I’d rather be compassionate. Like you say it’s impossible to know exactly what people are going through. I’d rather add than subtract from people’s lives – it’s corny but it’s true. I’m often proud by the things my kids say and I hope that they continue to be supportive and non-judgemental people as they grow up – the world will be a better place with more people like that. May you have a happy and healthy 2015. Thanks for all your lovely posts. I enjoy them all. Cheers! I love that top. The stripes make it Christmassy without being too obvious. I raised the neckline on that pattern by quite a lot when I made it. I didn’t want something that was just restricted to the ‘festive season’ – so this was a nice compromise. And the neckline is quite indecent! Life gets messy sometimes. I look forward to seeing all you great makes for 2015! Happy New Year! Beautiful top! I’m not really a new years resolution type, but it’s a good a time as any to take stock of what’s important and what needs to change. Wishing you a happy 2015! I’ve never liked resolutions. You never know what is around the corner so I’d rather go with the ebb and flow of life – and see where that takes me! I’m stuck for words, which is very unusual, as all the happy new year wishes sound a bit hollow. How about we go with ‘be true to yourself’ in 2015. Great top! I like that 🙂 I know it sounded rather gloomy – but I think I meant to be more reflective. It’s a way I like to live – being kind and brave are important things to be. Not as easy as we might like some days. That’s a lovely poem with lovely thoughts. I love the t-shirt! And it was written so long ago – but some things never tarnish. I like the shirt, but I really love the poem. Thanks for sharing. It’s a lovely sentiment – short but powerful. They are easy – but look stylish!